On this episode, I am joined by two guests in my studio. These two people are in, what we are calling, a “mixed (almost) marriage,” where one of the partners has been diagnosed with ADHD. Emily and Josh, a couple from Chicago, have been together for three years and sat behind my mics for this conversation. Josh has ADHD and Emily does not. He was diagnosed with ADHD right before they met, so his journey has coincided with their relationship. Josh works as a support engineer at a tech company and codes on the side for fun. Emily works at a non-profit for middle and high school girls. In this conversation, you will hear Josh and Emily share the techniques and strategies they have discovered and created to have a successful mixed relationship. The discussion includes their stories, their experiences, and their intentional efforts to overcome. [06:25] – Josh talks about his diagnosis. He met Emily a few months later, and he recounts his first impressions and conversation. [09:00] – Emily and Josh talk about the step of moving in with each other. 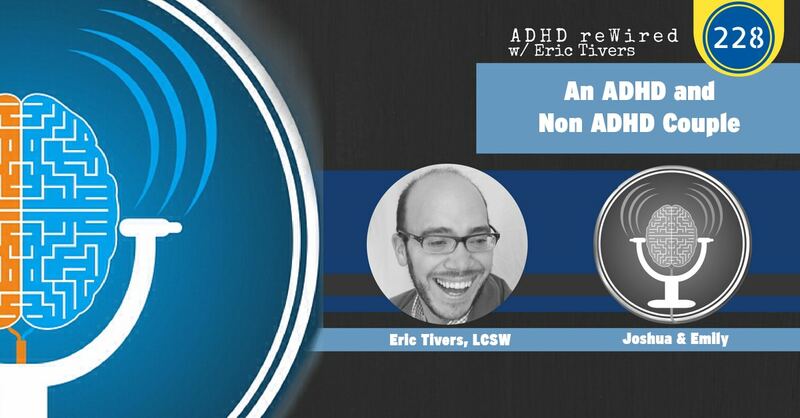 Emily explains what it was like to move in with someone with ADHD. [12:12] – Emily shares a tip she learned on this podcast. [14:25] – We talk about self-awareness being part of executive functioning. [17:00] – Emily talks about the discoveries they have made. [20:16] – Emily shares that Josh is quick to look at the system, and look for a solution that involves technology. [23:50] – Josh shares two changes he’s made with technology that has helped them. This leads to a discussion on setting alarms. [27:30] – Josh and Emily share what they have learned from each other. Emily says that Josh has helped her leave open space on her calendar. [30:26] – Emily gives some advice to the neurotypical person in a mixed marriage. [40:53] – Emily and Josh explain how they have names for features of ADHD. [48:40] – Emily says if you are with someone who was diagnosed as an adult, they are probably beating themselves up for things that have happened over the years. [49:45] – Josh explains that Emily pauses and gives Josh time to come up with the words to convey what he is going through. He provides an example. [59:37] – Josh shares what he finds challenging about Emily, as she is neurotypical. He goes on to explain how people with ADHD have an advantage with systems in this time of technological intrusion. [1:05:50] – Emily describes some strategies that help her in this relationship.